The remains of other parts of the castle lie beneath the grass of the inner bailey. It was surrounded by earthen banks and stone walls which had at least two towers. To the north were gardens and fishponds. The Hall possesses a range of 12th century figure sculpture. Above the capitals of its fine column are six musicians, each playing a different instrument. Although damaged, they are of superb quality. Almost certainly, the stonework was carved by masons who had worked at Canterbury Cathedral. They used local stone from Clipsham. The Castle was the residence of the lord of the manor of Oakham. Sometimes, the king held the manor himself and visited the castle. By the early 16th century many of the buildings were ruinous. 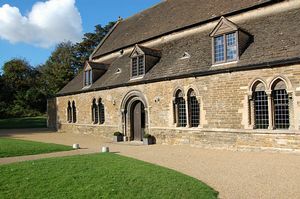 However, the Great Hall continued in use as a courtroom, the hub of both the manor of Oakham and the county of Rutland. Assize courts were held here until 1970. Today, occasional Crown Courts and Coroner's Inquests still take place. Over 200 horseshoes hang on the walls of the castle. 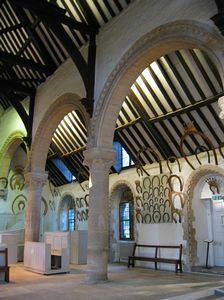 These represent the unique custom that every peer of the realm, on his first visit to Oakham, must forfeit a horseshoe to the lord of the manor. The custom has been followed for at least 500 years, and it probably originated soon after the Norman Conquest 1066. The oldest surviving horseshoe is probably the large elaborately wrought horseshoe headed by a plain shield put up by Edward IV in about 1470. The most recent were given by HRH The Princess Royal in 1999, HRH Price Charles in 2003 and Princess Alexandra in 2005. The Castle makes a wonderful venue for civl marriage and civil partnership ceremonies. To find out more visit the Oakham Castle website.